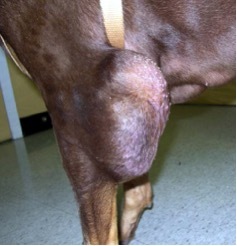 Just diagnosed a veterinary patient with soft tissue sarcoma? Read on! 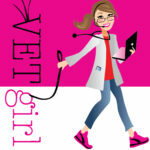 Today's VETgirl online veterinary continuing education blog is by guest blogger Dr. Christine Mullin, VMD, Diplomate ACVIM (Oncology), Hope Veterinary Specialists. STS are associated with two main challenges: 1) often deceptively invasive primary tumor growth (“tip of the iceberg” phenomenon), and 2) a variable risk for systemic metastasis, particularly to the lungs. The biologic behavior and expected prognosis for canine STS is highly dependent upon tumor grade, which is based on the following histologic features: degree of differentiation, mitotic index, and percentage of necrosis. There is a grading scheme which assigns a numerical score (1, 2, or 3) based on the degree of abnormality within each of those categories; the numerical values for each of the three features are then added together and this sum then determines whether the tumor is a grade I (low), grade II (intermediate), or grade III (high).1 Additional factors that may influence tumor behavior, diagnostic recommendations, and therapeutic approach include tumor size, rate of clinical growth, and tumor location.1-3 Upon diagnosis, patients typically undergo a series of tests (“staging”) including lab work, fine needle aspirate cytology and/or biopsy, and imaging (radiographs, ultrasound, +/- CT scan/MRI) to help determine the nature and extent (“stage”) of their disease. When considering additional local therapy options, although scar revision surgeries (removal of 2-3 cm around and 1 fascial plane below the initial incision) are effective at reducing the risk of tumor regrowth following incomplete excision, they are often not feasible because of tumor location (e.g. a distal limb with very little excess skin available). Undoubtedly, an aggressive surgery such as amputation would have a high chance of curing such a patient. However, although we as attending oncologists always want to do what is most medically appropriate for the tumor, we also have to weigh what negative consequences intensive therapy may have on the patient. For example, is that incompletely excised grade II STS of the distal limb life-threatening enough to warrant amputating the leg of that arthritic geriatric dog (a quality of life-threatening measure)?…Similarly, is it worth putting that same dog through labor-intensive full course radiation therapy (18 daily treatments under general anesthesia) – albeit a highly effective alternative for controlling incompletely excised STS long-term5,8,9 - when the risk of the tumor growing back in that old dog’s lifetime is only 1 in 3?7 To further muddy the waters, some studies have shown an even lower risk of recurrence of incompletely excised distal limb STS,10-11 therefore maybe odds are that nothing more needs to be done. However, if we do nothing and a tumor does recur along a tough area like the distal limb, treatment options become even more limited down the line. These are the decisions and scenarios we struggle with as veterinary oncologists managing the various presentations of canine STS. Finally, for STS that are not amenable to surgical resection, palliative radiation therapy can be considered as a means to provide improved comfort and partial tumor regression. The objective response rate for RT in this setting is roughly 50%, for a median tumor control duration of ~5 months.14 This therapy is typically given once weekly for 4 treatments and side effects are rare, although treatments do require general anesthesia. As outlined above, the continued advances made on both the human and veterinary oncology fronts have shown us that are not all tumors are created equal. Thus, a personalized approach that is based upon the entire constellation of tumor- and patient-related characteristics is more appropriate than simply assigning a “one size fits all” formula for treatment. 1. Liptak JM and Forrest LJ. Soft tissue sarcomas. In: Small Animal Clinical Oncology. 5th edn., SJ Withrow, DM Vail, Page RL, Eds., St. Louis, Saunders/Elsevier, 2013:356-380. 2. Hohenhaus AE, Kelsey JL, Haddad J, et al. Canine cutaneous and subcutaneous soft tissue sarcoma: An evidence-based review of case management. J Am Anim Hosp 2016;52(2):77-89. 3. Kuntz CA, Dernell WS, Powers BE, et al: Prognostic factors for surgical treatment of soft tissue sarcomas in dogs: 75 cases (1986–1996). J Am Vet Med Assoc 1997;211: 1147–1151. 4. Selting KA, Powers BE, Thompson LJ, et al. Outcome of dogs with high-grade soft tissue sarcomas treated with and without adjuvant doxorubicin chemotherapy: 39 cases (1996-2004). J Am Vet Med Assoc 2005;227:1442-1448. 5. Simon D, Ruslander DM, Rassnick KM, Wood CA, et al: Orthovoltage radiation and weekly low dose of doxorubicin for the treatment of incompletely excised soft-tissue sarcomas in 39 dogs. Vet Rec 2007;160:312–326. 6. Bacon NJ, Dernell WS, Ehrhart N, et al. Evaluation of primary re-excision after recent inadequate resection of soft tissue sarcomas in dogs: 41 cases (1999-2004). J Am Vet Med Assoc 2007;230:548-554. 7. McSporran KD. Histologic grade predicts recurrence for marginally excised canine subcutaneous soft tissue sarcomas. Vet Pathol 2009;46:928–933. 8. McKnight JA, Mauldin N, McEntee MC, et al: Radiation treatment for incompletely resected soft-tissue sarcomas in dogs. J Am Vet Med Assoc 2000;217:205–210. 9. Forrest LJ, Chun R, Adams WM, et al. Postoperative Radiotherapy for Canine Soft Tissue Sarcoma. J Vet Intern Med 2000;14:578–582. 10. Stefanello D, Morello E, Roccobianca P, et al. Marginal Excision of Low-Grade Spindle Cell Sarcoma of Canine Extremities: 35 Dogs (1996-2006). Vet Surg 2008;37:461-465. 11. Prpich CY, Santamaria AC, Simcock JO, et al. Second intention healing after wide local excision of soft tissue sarcomas in the distal aspects of the limbs in dogs: 31 cases (2005-2012). J Am Vet Med Assoc 2014;244:187-194. 12. Elmslie RE, Glawe P, Dow SW. Metronomic therapy with cyclophosphamide and piroxicam effectively delays tumor recurrence in dogs with incompletely resected soft tissue sarcomas. J Vet Intern Med 2008;22:1373-1379. 13. Burton JH, Mitchell L, Thamm SW, et al. Low-Dose Cyclophosphamide Selectively Decreases Regulatory T Cells and Inhibits Angiogenesis in Dogs with Soft Tissue Sarcoma. J Vet Int Med 2011;25:920-926. 14. Lawrence J, Forrest L, Adams W, et al. Four-fraction radiation therapy for macroscopic soft tissue sarcomas in 16 dogs. J Am Anim Hosp 2008;44(3):100-108. What is the date of article? Thanks! My 13 yr 5 mo old Black Lab/Grayhound mix has a rapidly growing tumor on her front right wrist. The vet did a fine needle aspiration and called me with the results today saying that it is a sarcoma, but to find out what kind of sarcoma he would need to send her to a surgeon for a tumor biopsy. The vet has not done an x-ray or blood work yet to see if the cancer has spread. He mentioned surgery and said that because of the location, an amputation may very well be necessary. My dog is not very sturdy on four legs so I can’t imagine her getting use to having three at this age. Her quality of life has been deteriorating in recent months. She has been having BMs in the house on a daily basis and trembles when she urinates. My husband thinks it is time to have her put to sleep. I just don’t know how much time she’d have left if we went through with surgery. We would hate to put her through all of that (not to mention the cost) only to lose her a few months later. She’s had a wonderful life. When is the right time to euthanize? I’m so sorry to hear that – I base it on quality of life. If she doesn’t want to eat well, doesn’t act like she used to, doesn’t want to play or go for a walk or do things she loved a few years earlier, I often think it’s time. It’s such a hard decision and I would recommend discussing it with your veterinarian. Keep in mind you can consider talking to your vet about starting a non-steroidal anti-inflammatory medication (VETERINARY ONLY) for pain too – that may also help!